​The 5th PALA summer school took place at the University of Kent, Canterbury, UK, from the 13th to the 15th July 2015. The theme was critical stylistics and the guest lecturers were Professor Lesley Jeffries and Dr Brian Walker (University of Huddersfield). The summer school was attended by 13 delegates from 10 different countries. 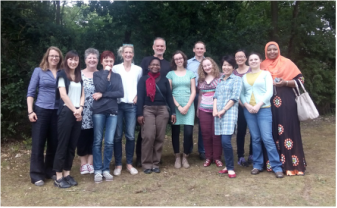 Sara Nittve, Sweden; Eri Shigematsu, Japan; Lesley Jeffries, UK (school convenor); Giuseppina Balossi, Italy; Anna Gudfinnsdottir, Iceland; Suzzanne Mpouli, France; Toby Lyons, UK; Emma Overmaat, Netherlands; Brian Walker, UK (school tutor); Maria den Hartog , Netherlands; Michi Shiina, Japan; Xianghui Li, China; Elisabetta Perra, Italy; Aishat Umar, Nigeria. In this session we consider what is meant by power and ideology. We go on to examine how texts organise the world we experience, and how this is demonstrable in the words and structures of the texts themselves. This session explores the various ways in which English texts ‘name’ or represent a view of the world. There are usually many ways of referencing the same things, and here we examine how the choices made by authors can create ideological meaning. In this session we will deal with the strand of meaning that relates most clearly to the verbal element of the clause and presents information on what is being done, what is happening, and what is. One thing that texts can do when they create a version of the world is to tell us what is seen as equivalent and what is seen as contrasting. In this session we consider how texts structure the world in terms of equivalence and opposition and the potential ideological effects such textually constructed meanings can have. This session considers the ideological effects of two related textual functions of exemplifying, where not all cases of a category are listed, and enumerating, where they are. We will discover that in English there is sometimes no linguistic difference between these functions which can create ambiguity, and this can have ideological consequences. So far we have assumed that texts represent the world as it is or how the text producer thinks it is. Many texts, however, construct non-existent versions of the world. Such non-versions can be created for a great many different ideological reasons. ​Texts present the speech and thoughts of other people and this can be very manipulative of their ideologies as well as those of the reader. Here we will consider the viewpoint of the participants who are discussed in texts but whose words and thoughts are mediated by a narrating voice of the text. Practical analysis using the tools introduced on the course.